Jupiter mounted a comeback Monday night after trailing by two runs in the ninth inning, to win 7-6 on a walk off wild pitch. Jorge Guzman started on the mound Monday and brought the heat along with him. The Marlins number five prospect allowed five hits and four runs in two 2/3 innings pitched, but he did remind everyone why he made the Futures All-Star game as he struck out three batters and sat around 98 MPH on his fastball. Out of the bullpen came Alejandro Mateo and Zech Lemond who pitched a combined five 1/3 innings, both were hitless and scoreless in there appearances on the mound. Tied at four apiece Vincenzo Aiello entered the game, the closer gave up a two run blast giving the Mets a 6-4 lead entering the bottom of the ninth inning. The Jupiter bats came prepared as they tallied a total of 13 hits. Riley Mahan and Lazaro Alonso both had spectacular games as they recorded three hits and two RBI each with Mahan tacking on a triple as well. The two infielders were the catalysts to the Hammerheads ninth inning comeback. Trailing by two runs with runners on first and second base the cleanup hitter, Mahan sent home Anfernee Seymour on a single to left-center field. 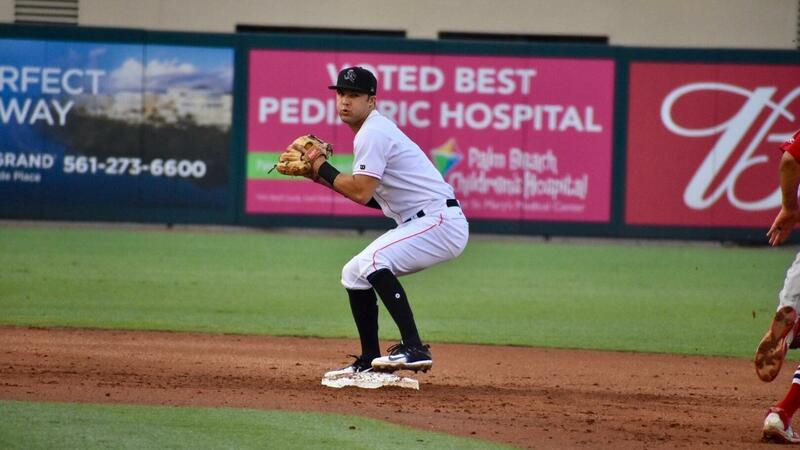 The following batter, Alonso sent the newest Hammerhead Jose Devers home from second base tying the game at six runs apiece. Devers recorded one hit and one RBI while scoring one run in his advanced A debut. To top off his monster night, Riley Mahan also scored the final run of the game after Mets pitcher Austin McGeorge threw a wild pitch, this was the second baseman's third run of the night. After an action packed game one, the Hammerheads host the Mets for game two starting at 6:30 P.M. on Tuesday night at Roger Dean Chevrolet Stadium. Tickets and more information can be found at Rogerdeanchevroletstadium.com/tickets-events.